The extraction of permanent teeth for orthodontic reasons has remained a debatable and challenging topic over decades. Although due to conservative concepts the rate of such extractions is decreasing,,, in some cases there is no other option. In such cases, the most frequent candidate for extraction is the first premolar, and in particular situations, the clinician may decide to extract the second premolar instead. Suppose that a patient comes to you for receiving orthodontic treatment; after analyzing the clinical and paraclinical documents, you come to the conclusion that there is no way but extraction of four premolars. But you see the patient has recently received endodontic or vast restorative treatments on the teeth candidate for extraction; what a waste! Too much of expense and maybe time-consuming treatments are now sentenced to death! The ethical point here is that the previous dentist should have referred the patient for an orthodontic consultation prior to drilling the teeth. Within the past 38 years of my professional orthodontic practice, I have faced several such cases. Recently, a young lady presented to our office with the chief complaint of gummy smile and bimaxillary dental protrusion. After analyzing her diagnostic records, the four first premolars were considered to be extracted based on the orthodontic treatment plan. However, the left upper and lower first premolars (teeth #24 and #34) had previous endodontic and restorative/prosthodontic treatments and now they are candidate for being extracted [Figure 1]. On the opposite arch side, the fixed partial prostheses were also modified [Figure 1]. All of the abovementioned previous treatments were unnecessary and could have been prevented (compare [Figure 1]a with [Figure 1]b). 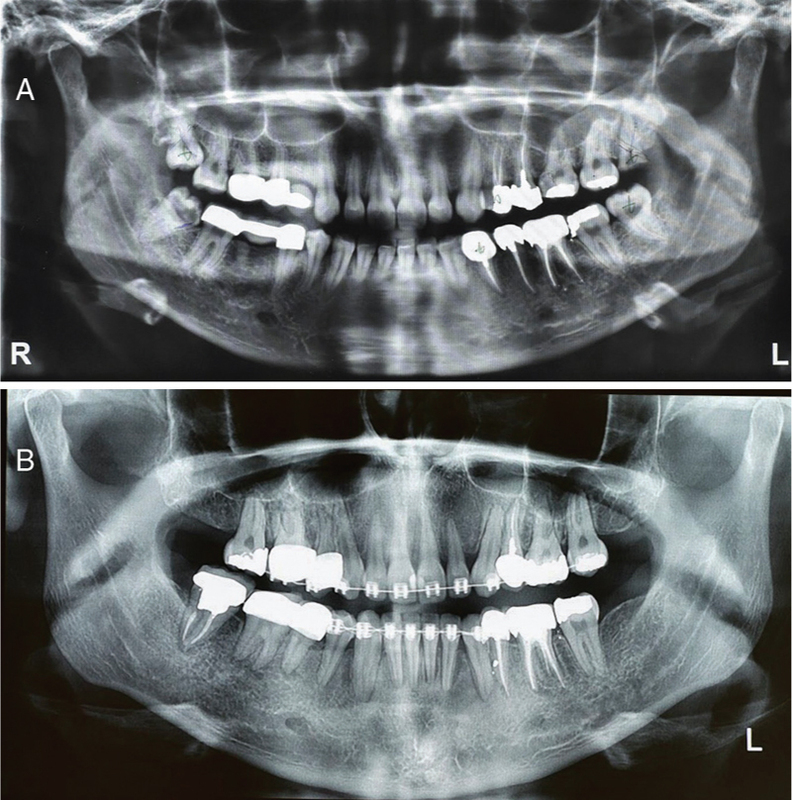 To prevent such unpleasant happenings and probable legal disputes, the authors suggest that prior to rendering any endodontic or restorative treatment on premolars, especially in young patients with crowded or protruded dentition, dentists refer the patient for an orthodontic consultation. If such patient needs a rapid root canal treatment due to the acute symptoms, the dentist can plan for a two-visit endodontic treatment and refer the patient for consultation between the visits. The authors certify that they have obtained all appropriate patient consent forms. In the form the patient has given her consent for her images and other clinical information to be reported in the journal. The patient understands that her name and initial will not be published and due efforts will be made to conceal their identity, but anonymity cannot be guaranteed. Dardengo CS, Fernandes LQ, Capelli Júnior J. Frequency of orthodontic extraction. Dent Press J Orthod 2016;21:54-9. Jackson TH, Guez C, Lin F-C, Proffit WR, Ko C-C. Extraction frequencies at a university orthodontic clinic in the 21st century: Demographic and diagnostic factors affecting the likelihood of extraction. Am J Orthod Dentofac Orthop 2017;151:456-62. Janson G, Maria FR, Bombonatti R. Frequency evaluation of different extraction protocols in orthodontic treatment during 35 years. Prog Orthod 2014;15:51. Joseph S, Diack L, Garton F, Haxton J. Interprofessional education in practice. Clin Teach 2012;9:27-31. Wilder RS, O’Donnell JA, Barry JM, Galli DM, Hakim FF, Holyfield LJ et al. Is dentistry at risk? A case for interprofessional education. J Dent Educ 2008;72:1231-7.